Houdini Receives The Big Screen Treatment!! 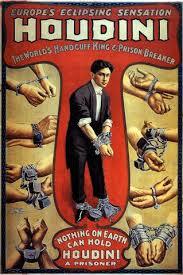 The life of celebrated escape artist and magician Harry Houdini is fertile entertainment ground. Producer Jimmy Miller and Sony Pictures, is bringing the life of ‘Houdini‘ to the big screen with a HP Lovecraft twist. Max Landis, writer of 2012’s ‘Chronicle‘, the upcoming ‘Me Him Her‘, and highly anticipated 2015’s ‘Frankenstein‘ starring Daniel Radcliffe and James McAvoy, will re-write the screenplay that was originally put in place by scribe Scott Frank. 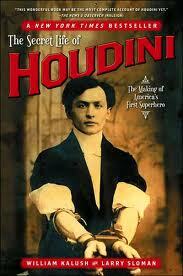 In what seems true Hollywood fashion, Summit is also bringing a project into play focusing on The Great Houdini. A silver screen adaptation of the book ‘The Secret Life Of Houdini: The Making Of America’s First Superhero‘ by William Kalush and Larry Sloman. Summit’s feature tells the story of Houdini as a master spy. In addition to the two feature films, there is also a Broadway musical that is using Houdini as it’s subject matter. Hugh Jackman was attached to the musical before a conflict of schedule came up. The life of Harry Houdini, born Erich Weiss, the man who married his wife three separate times just to appease both his and his wife’s religions, is full of intrigue and drama. I’m curious to see how the movies fare against one another. This entry was posted on Wednesday, January 15th, 2014 at 10:09 am	and is filed under Books, Film, News. You can follow any responses to this entry through the RSS 2.0 feed. You can skip to the end and leave a response. Pinging is currently not allowed. « HBO’S ‘The Newsroom’s’ 3rd Season Will Be Its Last! !